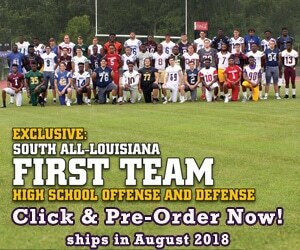 There are a lot of great football players that play for powerhouse programs like West Monroe, John Curtis, Rummel, etc. and sometimes they get recruited highly because of the big teams they play for. Those high profile players only have to play one position for their school as well, There are also diamonds in the rough when you are looking at high school recruits that come from small schools but those players are just as good as the kids that play for the bigger schools and they also have to start on both sides of the football. RB/LB James Evins belongs in that second category. James Evins has track speed but he uses that speed to his advantage when it comes to football. Evins flies to the football as a linebacker and as a running back, he will give you every thing that he can. He also has a little swagger to him when it comes to playing the game of football. When you talk to him, you immediately can tell that he loves to play with his teammates. Last year was a breakout year for Evins as he was named 2nd team All-District as both a linebacker and a runningback. This year, he wants to prove himself even more that he can play this game. Evins has decent size to play running back or safety and can play both. If he continues to add more weight, he will probably play linebacker. College coaches would love to have guys that are versatile and can play different positions for the team. Evins also has really good speed as he made it to state last year for track and can run a 10.9 in the 100 meters. On the football field, he has really good speed as he is timed at a 4.5/40. Louisiana Football Magazine Editor Lee Brecheen loves the progress that James Evins has had as a football player. “James Evins is a great track guy,” Brecheen said. “He has definitely improved a lot over the years and I think that he can be a big sleeper in the Alexandria area. Evins is really versatile and can play a lot of positions.” As far as the team, Evins wants to lead Oakdale out of a 6-6 year and lead the Warriors to a breakout year. Players like James Evins are everywhere in Louisiana. You just have to dig hard to find those diamonds in the rough. Read more about James Evins as he talks about the season, last year, track and field, his favorite players, and more in today’s recruiting interview! LAFM: What’s your 40 yard time, max bench press, max squat max, vertical? 85 tackles and 23 were solo. I got 2nd team All-District as a running back and linebacker and was also awarded Best LB award from my coaches two years straight. LAFM: What are some things that you look for when you are looking at colleges? I look for a lot as far as education and the major that I want to go in. I love a good atmosphere of happy and positive people also. LAFM: Last year, the team went 6-6 and made the second round of the playoffs. What is the next step for the team this year? The next step for us is to get out of this 6-6 rut we have been in and show everyone that Oakdale is not what they label us as. We are a strong team, but we just had too many child like mistakes. LAFM: You play two positions: running back and linebacker. Which position do you like playing more? I would have to say that I enjoy linebacker more just because of my defensive co-ordinator Brian Deville. He puts his trust in my hands to run and control the defense. There is nothing better than making a tackle for a loss on defense, and then making the crowd go wild. I do admit that I love running the ball also. Touchdowns help my team, and I’ll be doing a lot of that this year. LAFM: Which position have college coaches told you that you are going to play in college? If I continue to gain weight, I will most likely stay at linebacker, but it’s also a possibility that I could move over to safety or just stay at runningback. LAFM: This year returns a good team and a lot of players are returning on both offense and defense. Who are some of your teammates that you feel like would have a good season this year? I don’t like to just single out a few players because we are a team, but some key players this year on defense will be Jonathan Johnson (DT), Travian Dailey (DT) as well as my two linebacking bros Jalin Russell and Malik Heyward. On offense, a few key players are my whole offensive line, my FB Hunter Longino, and my wide out Terrance Holmes! LAFM: What was your favorite game playing for Oakdale and why? My favorite game playing for Oakdale had to be my freshman year against Welsh High School at home. I got my first tackle for loss and fumble recovery in that game. LAFM: Which team are you looking forward to playing this year? I’m looking forward to playing Welsh, Kinder, Iowa, and Pickering. These are teams I give props to because they all play hard, but this year will have to be a different outcome against them! LAFM: What are some of your strengths as both a linebacker and runningback? Some strengths at linebacker that help me is knowing how teams run their offense. I know what kind of run and what hole teams are going into just because I also play running back. Linebacker also helps me on offense because I know the responsibility of most linebackers so I can use that against the other team and capitalize for a big run or touchdown. LAFM: What are some areas that you need to improve on? I need to improve on my pass coverage. It’s very important that linebackers make plays in coverage like Luke Kuechly (former linebacker for Boston College and NFL Pro Bowl linebacker for the Carolina Panthers). LAFM: Not only are you a star football player but you are a star track runner as well. What do you run in track and what are your best times? I made it to state this year in track in the 100 meter dash at the 200 meter dash. I placed 5th in the 200 and 4th in the 100. I will say if I didn’t stumble on my start, I would’ve won the whole thing. I plan on winning it all this year. My best times were a 10.89 in the 100 and a 22.00 in the 200. LAFM: If you had to compare yourself to one college or NFL player, who would it be and why? I would compare myself to Kwon Alexander (former LSU linebacker now with the Tampa Bay Buccaneers). I feel we are alike because we both weren’t necessarily the biggest but with hard work, anything is possible. Something interesting about me that no one knows is that I’m addicted to editing pictures! My individual goals for the season will be to win the district title, go 10-0 finish the season with 130+ tackles and 2,000 rushing yards! LAFM: Is there anybody in your family that has played high school, college, or even in the professional level? If so, who are they, where did they play, and what position? My grandpa and dad both played at Oakdale. My grandpa played linebacker and had 105+ tackles all 4 years of his high school career. My dad played runningback and fullback. He is 2nd in most rushing yards in a season at Oakdale High School. He had offers from LSU and more but due to me and my sister being babies, he decided not to take them and just went to community college. LAFM: What would you tell the college coaches reading this article? I would tell the coaches that I’m ready to put on a show for you guys! Your trips to come scout my games will be worth every second. I am putting the team on my shoulders this year for big things!